The Power of Point of View goes beyond simply defining the various POV options and shows readers how to use this powerful narrative to enhance and tie together all other story components. This is a Writer's Digest Book. Don't miss the bonus excerpt below! Point of view isn't just an element of storytelling; when chosen carefully and employed consistently in a work of fiction, it is the foundation of a captivating story. It's the character voice you can hear as clearly as your own. It's the unique worldview that intrigues readers, persuading them to empathize with your characters and invest in their tale. It's the masterful concealing and revealing of detail that keeps pages turning and plots fresh. It's the hidden agenda that makes narrators complicated and compelling. It's also something most writers struggle to understand. In The Power of Point of View, RITA Award-winning author Alicia Rasley first teaches you the fundamentals of point of view--who is speaking, why, and what options work best within the conventions of your chosen genre. Then, she takes you deeper to explain how POV functions as a crucial piece of your story, something that ultimately shapes and drives character, plot, and every other component of your fiction. NO RULES! POV is a tool for characterization and narration, not a rule to control your writing. You can get your own signed copy here! It's just $18 postpaid for US shipping. ($33 for non-US shipping.) Scroll down! Shipping within the United States: $18 postpaid. YOU DO NOT NEED A PAYPAL ACCOUNT. Choose "Pay with Credit/Debit Card" instead of logging in. I consider myself a fairly advanced writer. I've studied POV in writing courses and on my own, and it's a topic most writers tend to struggle with... and most tend to fall into the "safe" first person and third person, because they are easy, and easily understood. What Ms. Rasley has done is put together an exhaustive reference of OTHER choices, complete with examples and reasons why a writer might choose them to tell a particular story. To me, that is what makes this book worth every penny of the purchase price: demystifying the choice of WHO should tell a particular story. If I had to whittle my large collection of writing books down to just a handful, this is absolutely one I would keep! 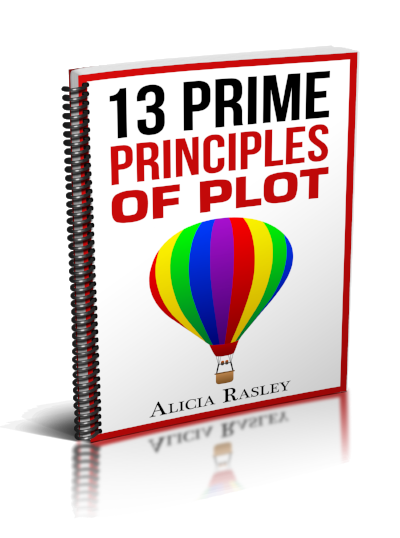 As anyone who has read her other books or taken one of her seminars knows, the hallmark of Alicia Rasley's teaching is that she gives you the tools you need to fix the technical problems that keep your writing from selling. A lot of writing books play to the fantasy that you're going to write something wonderful, but beyond some platitudes they don't give you much help in doing that. Not Alicia's. She gives you example after example, chosen from many different genres, that show you what works, and more importantly, what doesn't work, and why. She also gives you exercises that get you examining your current work in progress so you can improve what you've already written to make it stronger. If you've been writing a while, you've probably heard all the rules. Don't switch point of view. Or switch only after you leave a few blank lines. Or switch whenever you like, as long as it's a weekday. The problem is, such rules tell you almost nothing about using the writing element of Point of View to develop your characters and individualize your narrative. Rules are about confining your writing-- this book is about liberating you to discover your characters' unique perspectives and to experiment to find the best narrative for your story. I had been attempting to write novels for literally decades without ever finishing a single one when I encountered this extraordinarily useful guide some years ago. With its help I finished the novel that, after several years of revisions, I sold to a major publisher. Later, when I set out to write the books my publisher had contracted for, I returned to The Story Within Plotting Guide anytime I got stuck. Working through the exercises and examples always helped me pinpoint the issues I needed to address to make my story work. "If you are serious about writing fiction, but can't quite get your head around the intricacies of plotting, this is the book for you. No other book about writing goes into the same level of detail or gives you the practical step-by-step hand-holding you'll find here. Jenny Brown, Avon author. Your pedagogy is amazing, all those thoughtful usable exercises. It should be the textbook for a semester long writing course focusing on POV. You should get a PhD for it, too, and awards, along with grateful thanks. Judith Stanton, award-winning author and college professor. In your POV book, I liked how you demonstrated a sketch scene (for the writer's purposes) then showed us how to translate it for the reader, revealing the characterization through thoughts, inner motivation, action and the dominant emotion. In other words, the writer "tells it to himself" and then translates it to "show the reader." Show, don't tell. What is viewpoint or point of view? It is the perspective from which the reader experiences the story. That's the simple definition. As you might expect, it gets more complicated the more you explore the subject. Point of view is the vehicle your reader uses to travel through the story. That is, point of view is reader-oriented, but author-controlled. You use character viewpoint to control whether your reader experiences this battle scene through the perspective of the general who is commanding the army, or the raw recruit trembling in that trench, or the war correspondent who reports but does not fight, or the nurse waiting in the hospital tent for broken bodies to mend. Always keep in mind the experience you want the reader to have while reading your story. If the reader is going to want to puzzle out who the villain is, you for sure don't want to blow the secret by going into the villain's viewpoint (unless you can still hide the identity then). On the other hand, if the reader should be experiencing the horrible twisted mental processes of a psychopath, you will want to do extensive passages from the villain's crooked perspective. Now I better confess my own bias. I am a purist-- that is, in general I use only one pov per chapter.I know I'm stricter than most. Even most purists change POVs from scene to scene, and I have done that. But mostly I stay in one for a chapter-- that's about 12-15 pages. See, I tend to write very long scenes! So I might have only one scene in a chapter. But this is a personal thing-- it's what works best for me. I think other POV approaches are also valid. No rules! I'm just going to offer guidance on how to decide what works best for you and your story, and how best to exploit its potential for characterization and information conveyance. Nonetheless, keep in mind that no rules doesn't mean anything goes. You can ruin a reader's experience of your story by refusing to use the powerful tool of point of view. But by developing this element fully, you'll bring control to your prose and depth to your characterization-- and give your reader the experience you plan. For example, if you want the reader to have a more intellectual experience (such as solving a mystery), you can use a distant POV. If the reader should be chilled and thrilled, you'll want to go in more closely. If you want the reader to sense the hero has a secret, but not what the secret is, you will have to be more cagey. :) Most important, you will sometimes (perhaps all the time) want the reader to experience the WORLD as the viewpoint character does, through her eyes, her nose, her fingers, etc– her perceptions. This can only be done through tight control of point of view– but the effort is worth it, as the reader gets greater participation in the story, and at the dawn of the new millennium, interactivity is something readers are seeking. You can get a signed copy!